6' Beginners lifting Olympic bar. 51" between collars for use on Olympic benches. 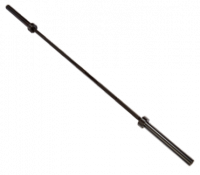 28.5 mm bar, 400 lbs weight capacity. Snap ring design holds sleeves. Chrome finish, for all Olympic plates. Solid steel, chrome finish, for 1" plate. Solid steel, black finish, for all Olympic plate. The 7’ shaft is coated with black zinc, is 28mm diameter with a 4” center knurling, 150,000 PSI (minimum) 1500 lb. statstical test bar. This bar can be put into any application without worry and is virtually maintenance free. The sleeves are made of one-piece roll pin construction. Perfect for use in a high school or college weight room. 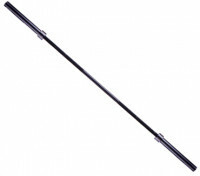 7’ black zinc coated power bar, 1500 lb. statical test, 4” center knurling. Snap ring design. This bar is designed to go into a club environment. 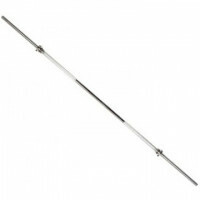 Great for light commercial usage, this 84” black oxide coated power bar is equipped with pinned, polished steel sleeves. This American made bar is 28 mm in diameter with medium diamond knurling and a 1200 lb. statical test rating. Our sleek new, 6 1/2ft, 15kg women’s training bar has a 25mm bar shaft that is easier to grip and control that is specifically designed for functional training. 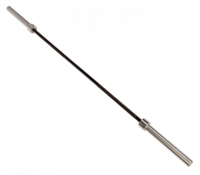 Despite it’s smaller diameter, it has an extremely strong yield strength that provides plenty of desired “whip.” The shaft has an attractive patina (copper) color which contrasts well with black painted sleeves to give it a distinctive look, while being fastened securely with dual snap rings for consistent, reliable performance. 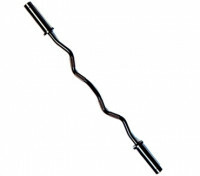 The TROY 47” Commercial Quality Curl Bar is a 27 mm bar with deep diamond knurling for a positive grip and feel. Sleeves are secured via roll pin design. 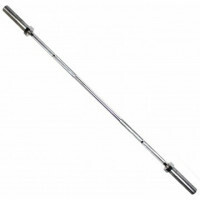 The USA 34” Deluxe Cambered Pro Style Lat Bar with forged swivel is a gym favorite. It is designed to exercise the muscles of the back, shoulders, and arms though a perpendicular range of motion. 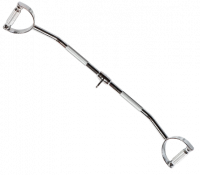 The TROY 47 Commercial Quality Curl Bar is a 27 mm bar with deep diamond knurling for a positive grip and feel. Sleeves are secured via roll pin design.